Private Hot Tub: This is a private home and likewise, you have a private hot tub. Have peace of mind knowing you're not at a condo complex where you may find yourself competing with 50 people for one hot tub. See our hot tub. King sized beds: Get a good nights rest in one of our three king sized beds with high quality matresses and crisp clean sheets. Take a look. Private bathrooms: No sharing the bathroom with your friends. All 4 bedrooms in this house has a full size bathroom, stocked with linens, soaps, shampoos, conditioner, and a hair dryer. Take a look. Gas Grill: Never run out of fuel on our grill because it's hooked to the main supply on the house. This is no cheap grill either. Check out our gas grill. Complimentary Gourmet Coffee: We love coffee, and we hope you do too. Not only do we have a normal coffee maker, but we also have a Gourmet coffee maker. Both are stocked with complimentary coffee. Look at our coffee maker. Free Video on Demand: In a little box beside the television we have Netflix streaming into the townhome. Netflix has thousands and thousands of movies, shows, and documentaries that can be watched on demand. Private Utility Room: Go home with your clothes already washed, thanks to our private utility room with full sized washer and dryer. 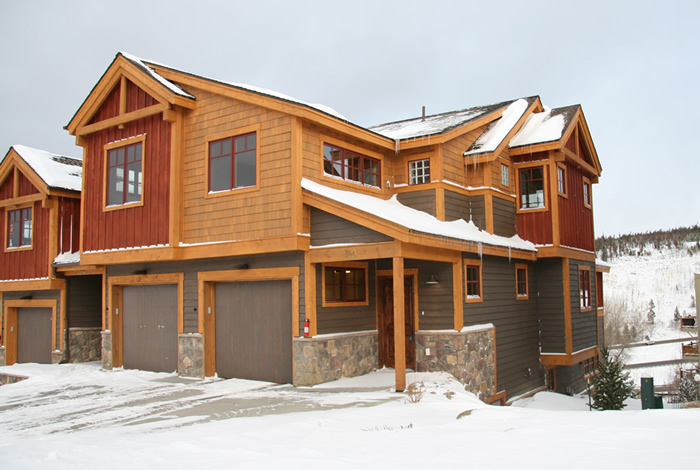 This Silverthorne condo is conveniently located just minutes from Summit County's major ski resorts of Breckenridge, Keystone, and Copper Mountain. 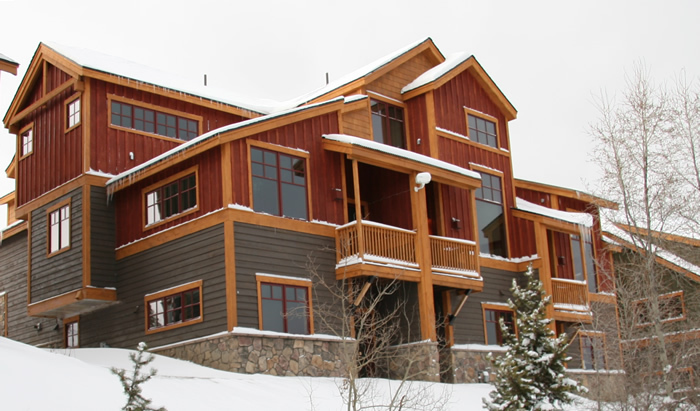 Eagle County's famous Vail ski resort is only 20 minutes away, and our condo in Silverthorne is a refreshing alternative to the dense crowds you'll find at Vail. The area provides not only skiing, but activities for all seasons. Summer excursions include hiking, mountain biking, and canoeing. Silverthorne is also a shopaholic's fantasy. When taking a break from nature, head to one of Silverthorne's outlet malls to shop or dine. If you're looking for some fresh cool beer then head over to the Dillon Dam Brewery. Three parking spaces are available. One in the garage, one directly in front of the garage, and one overflow in the slot to the right of the garage. Please note that the overflow spot is available to anybody's guest. If our overflow is full you're welcome to park in one of the adjacent overflows. There are three levels to our Silverthorne condo. The drive-in level is shown in the photo to the left. At the drive-in level you can park in the garage. There is a ski rack in the garage where you can hang your coats and take off your ski equipment. As you enter the house from the garage or the front door you'll walk into a hallway that has a bathroom, a coat closet, and a sitting bench. As seen in the photo to the right the kitchen, dining room, and living room of the Silverthorne townhome is nice and spacious. The kitchen is fully equipped with everything you need for dining including silverware, plates, bowls, glasses, pots, pans, crockpot, etc. There is a coffee maker and a toaster on the cabinet. The aspen dining table comfortably seats 6 with plenty of room to scoot in and out. The sleeper sofa in the living room is serious business! We tested dozens of sleeper sofas before deciding on this one. It has a nice 7 inch mattress, and we promise you won't feel bars in your back when you're trying to sleep. The bed will feel comfortable just like a queen size bed should. The floors above and below the main floor have two bedrooms each. Every bedroom has its own full size private bath and other fine amenties like a wall-mounted hair dryer, recessed lighting and high ceilings. Of course this Silverthorne Lodge has windows all over the place, each with its own unique view of the magnificent Rockies. 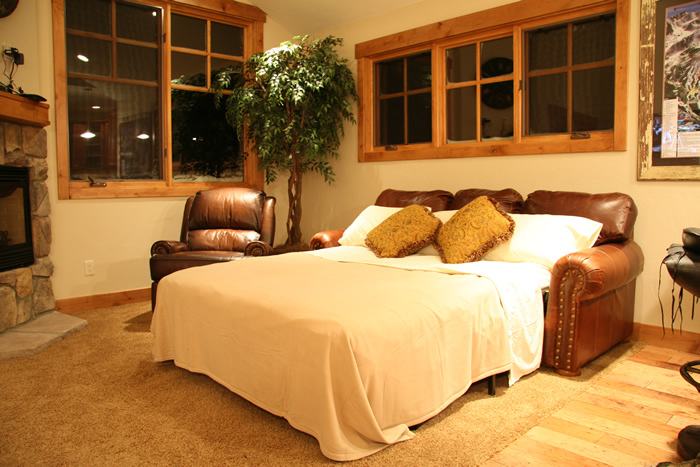 Bedroom 1 is located downstairs on the south side of the Silverthorne townhome. It has a porch and a great view of the Silverthorne valley. (You can see this view anywhere in the world thanks to our live Silverthorne Condo camera. A huge king sized sleigh bed sits in the middle of this room. It is equipped with a baby crib, a 32 inch flatscreen television, and a full sized bathroom. All of the bathrooms are stocked with clean towels and washcloths, tissue, and individually wrapped soap, shampoo, conditioner and lotion. Bedroom 2 is also located downstairs on the other end of the Silverthorne townhome. It has aspen lodgepole bunk beds that consist of a full sized bed on the bottom and a twin sized bed on the top. On the wall across from the bed is a nice 32 inch flatscreen television. This bedroom has a fully stocked bathroom as well. 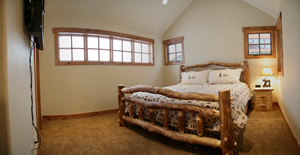 Bedroom 3 of the Silverthorne Ski Lodge is located upstairs on the south side of the house. 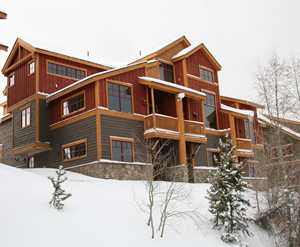 It has a beautiful view of the starlit ski and the Silverthorne / Dillon valley. On a clear night you can actually see the stars moving slowly across the ski. This bedroom is equipped with a king sized aspen lodgepole bed, a 32 inch flatscreen television with over 100 stations and a fully stocked bathroom. Snuggle up in this cozy room with a movie from one of the premium channels on the television as you rest for the next exciting alpine day! Bedroom 4 may be the last in this sequence, but its amenities are just as good as any of the the bedrooms in the Ski Silverthorne Lodge. It has a aspen lodgepole king sized bed, a 32 inch flatscreen television, and a fully stocked bathroom. Just the same as the other king sized beds, this bed has a top shelf Doctor's Choice mattress to promise you nothing less than a good night's sleep. Relax your muscles after a day of skiing, hiking, biking, or shopping. 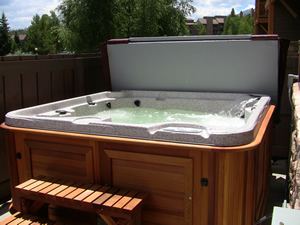 Our 6 man hot tube is brand new and has powerful massaging jets to work on your back and legs. It is lighted so it can also be used at night. We made sure to include a three-step entry so even children can enter safetly with adult supervision. Aside from being a great place to stay, our Silverthorne condo is centrally located to all major attractions in summit county. Hardly any attraction is more than 15 minutes away. In fact most are less than 10 minutes away like Keystone Ski Resort, Dillon Dam Brewery, the Silverthorne Outlets, Red Mountain Grill, and the Silverthorne Recreation Center. The bus stop is located just feet from our Silverthorne vacation rental. Simply step outside and catch the bus that comes by every hour during the off-season and every 30 minutes in the peak season. From here you can access anything in summit county including Breckenridge, Copper Mountain, Keystone, Frisco, Silverthorne, and Dillon. 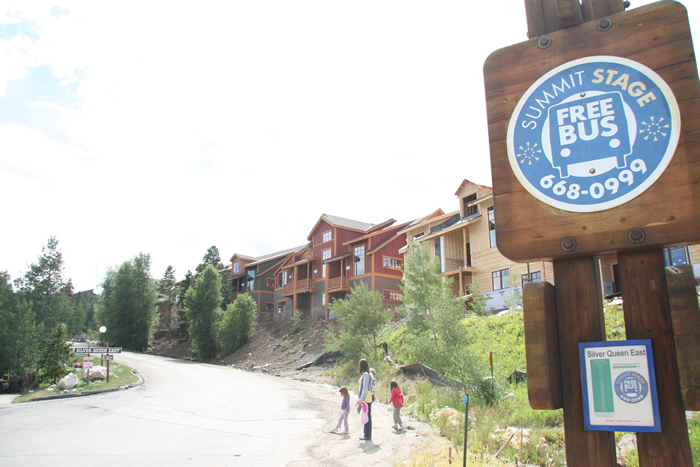 Be sure to download the most recent copy of the summit county bus route before arriving. 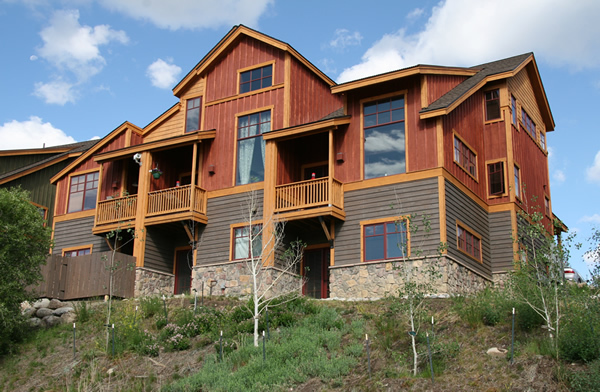 There's no better way to beat the heat than to stay at the Silverthorne Lodge in the spring, summer, and fall. It rarely gets above 72 degrees here so it's perfectly okay to visit a festival at high noon and not break a sweat! Some spring, summer, and fall activities include boating, shopping at the Silverthorne outlets, hiking, biking, fishing, and festivals almost every weekend. Lots of people even like this time of year for getting married at the Silverthorne Pavilion. We have accommodated lots of wedding parties at our Silverthorne Lodge because the Silverthorne Pavilion is only one mile from here. Well, what do you think? 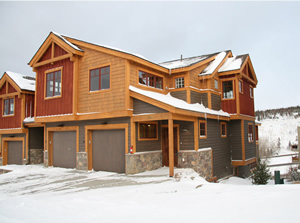 Are you ready for some Silverthorne Lodging at this Silverthorne Vacation Rental? We sure hope so!